I've decided to submit a post to the sticky fingers gallery today about friends. This is a picture of my three bridesmaid at my our wedding back in 2006. The friend on the far left I have known for over 30 years. My mum took us both to school on our first day and there is a picture of us both in our school uniforms together (though unfortunately the top of her head got cut off!). We went through our awkward teenage years together as we lived only a few minutes walk from each other. The friend in the middle I have known since I can remember and we also went to school together. 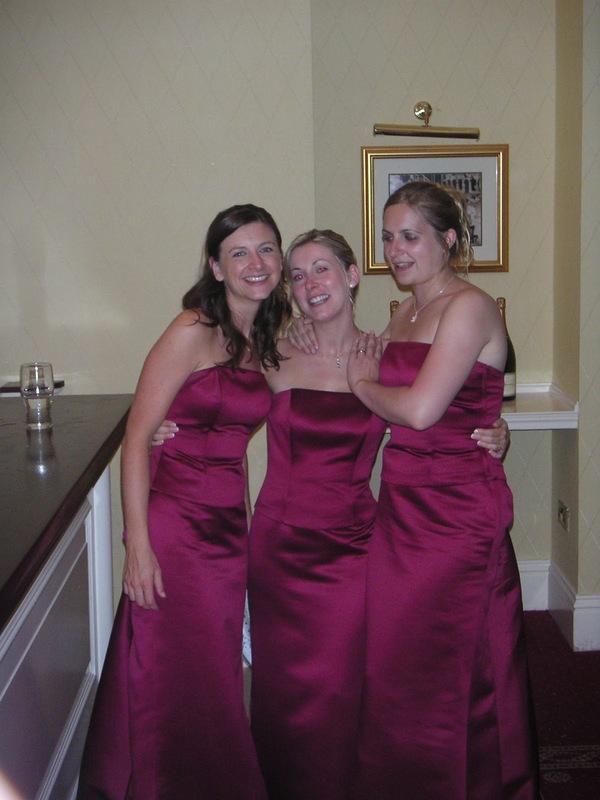 AND finally the friend on the right - we met at secondary school and I made her be my friend (I don't think she really wanted to!). We went to uni together and lived together in a shared house in my final year. These are the friends I feel the most comfortable with, even though maybe we don't have as much in common as we used to. There is nothing I could say to them that they wouldn't understand and wouldn't support me with. Of course, I have made good friend since then, but the bond I have with these three women is like ...... sisterhood. Lovely photos and great to have such good friends for so long. We moved house a lot when I was a kid so my best friends don't go back as far. Shame as there is something extra special about having a friend from when you were a child. x PS Gorgeous dresses too! Thank you! It is nice having people from way back, and although we've had our ups and downs we have always been present in each others lives. I still love the dresses too!